Kevin Hillstrom: MineThatData: Hillstrom's 2011 Almanac: Digital Versions Are Available!! Hillstrom's 2011 Almanac: Digital Versions Are Available!! Are you looking for the perfect Cyber Monday gift? 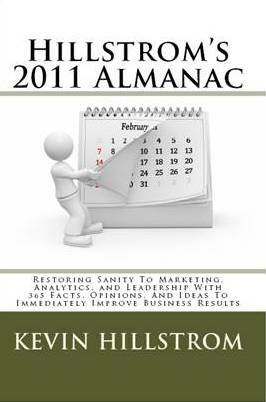 How about Hillstrom's 2011 Almanac? You get 365 practical tips for improving business tomorrow morning, I mean, how do you beat that? And this isn't going to cost you the $750,000 you'll spend with your favorite Management Consulting firm. You'll pay a far more reasonable price for great information! The book is now available in two digital formats. The Barnes & Noble Nook version is available for $7.95. The Kindle version is available for $7.95 as well. Let me know if you cannot download it, the book appears to be ready for distribution. The print version, via Amazon.com, will be available in the next 2-7 days, and will cost you just $14.95. The print version, via Createspace, is now available for $14.95. Personally, I'd hold out for the release of the Amazon version, as you are likely to receive it faster (and you can add an item and get free shipping). It's time to get your 2011 Almanac, be ready for 2011 with 365 marketing, analytics, and leadership tips!